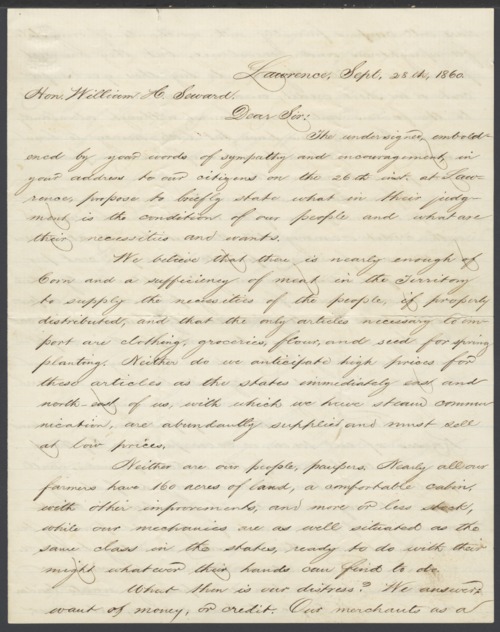 A letter written by Charles Robinson and James M. Winchell to William H. Seward asking for relief for the people in Kansas Territory. They are requesting money at a reasonable interest rate. Robinson and Winchell report that the farmers were unable to pay their debts because crops were ruined by a drought. A searchable, full-text version of this letter is available by clicking "Text Version" below.